The absolute control that you can have over this large room space heater is the distinction between other products from the same type. This TRUSTECH unit comes with a built-in infrared remote control that can run the 3 power modes, the timer and the temperature settings with a slight touch of the buttons, no matter where you are in the room. Also, you would be pleasantly surprised when you find out more about the other features this ceramic heater has to offer you. To start off, the space heater’s design is specially made to match the furniture in your room without being too obvious or conspicuous. Also, the size of the unit allows you to place it even in the smallest living spaces. And with its 5.4 pounds weight and practical notch at the back, you can carry it anywhere you want it to heat. 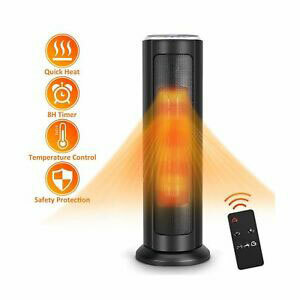 This product needs only 3 seconds to make a difference in your room temperature without being noisy at all. Nevertheless, the connection between the heating body and the base may not feel as stable and fixed as it looks. 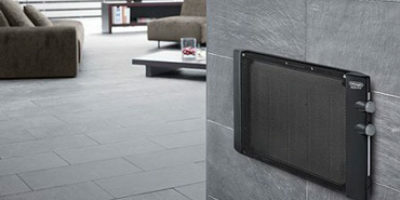 The 2 heating modes will give you the chance to decide how fast you want your living space to be heated, choosing from 750w at Low mode and 1500w for the fastest High heating mode. Moreover, there is a Cool mode as well which can be set at 50°F and therefore you can use the ceramic heater even in the summer. As for the temperature ranges, the maximum setting is 95°F and thanks to the electronic thermostat, your heater will turn on and off to keep a steady temperature based on its settings and the heat level in the room. And when the desired temperature is reached, the product will stop blowing warm air and instead the fan will be on. However, no matter how high the heat is, you may notice that the fan is not powered enough to spread it around the room even with the oscillation function on. 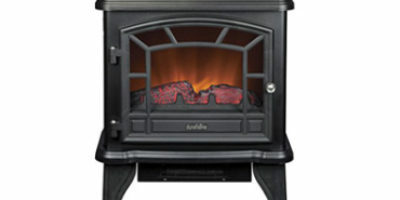 The controls on the heater are position on the top where you will find the LED display along with the operating buttons. Still, you might get confused by the number of buttons indicating “on.” There is one power button for on and off at the back, another on the interface with the power icon and a third one saying “power” next to it. Also, the display light glows even when the product is not working, which can bother some of you at night. And regarding the remote control, it is very functional, and all you have to do is point it in the direction of the heater. This unit comes with overheating and tip-over protection which is going to be activated once the heater becomes hotter than 95°F or when it loses its balance and is not standing upright. In addition, in case the ceramic heater turns off due to overheating, you should wait for 30 minutes to cool down and then reset it. This way you can be sure that no unexpected dangerous situations are going to occur. Also, for safety issues, it is not recommended to place the heater near places exposed to water like bathrooms, showers or swimming pools. TRUSTECH gives you a 1-year warranty on this ceramic heater as well as 24/7 customer support.